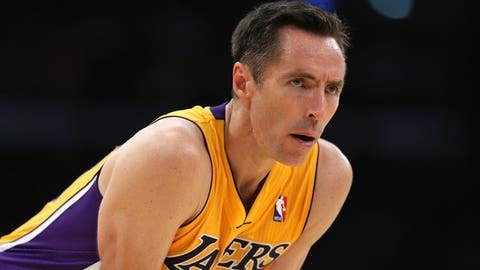 It's still unclear whether or not Steve Nash will be in a Laker uniform next year, but it appears he'll be done for this season after Lakers take on the Mavericks tonight at Staples Center. It’s been a sad year for the Lakers, so it’s only fitting they would wrap up the regular season with a whimper. Pau Gasol is one of many Lakers likely done for the season after a severe recurrence of vertigo, and on Friday Steve Nash told reporters that tonight’s game against the Mavericks will likely be his last of the 2013-14 campaign. Nash has played in just 13 games this season, but he currently sits 12 assists from surpassing Mark Jackson for No. 3 on the all-time list. But it should be noted that he had 10 in his last game against the Portland Trail Blazers. At least there’s always a bright side.